"Fire brigade reservoir built in the form of a swimming pool, probably in early 1944." The pool was a pool. It was meant for the detainees. "The working hours were modified on Sundays and holidays, when most of the kommandos were at leisure. Roll call was at around noon; evenings were devoted to rest and to a choice of cultural and sporting activities. Football, basketball, and water-polo matches (in an open-air pool built within the perimeter by detainees) attracted crowds of onlookers. It should be noted that only the very fit and well-fed, exempt from the harsh jobs, could indulge in these games which drew the liveliest applause from the masses of other detainees." (De l'UniversitÈ aux camps de concentration: Telmorgnages strasbourgeois, Paris, les Belles-lettres, 1947, p. 453). Auschwitz I was made up of 28 blocks built of stone laid out in three parallel rows between which ran paved streets. A third street ran the length of the quadrangle and was planted with birch trees, the Birkenhaller intended as a walkway for the detainees, with benches; there also was an open air swimming pool (booklet of 32 pages printed in Caen, 1948, p. 10; its text is a reproduction of the author's article published in Etudes germaniques, n 3, 1948, pp. 244-275). M. Klein, professor at the Strasbourg medicine faculty, took care to point out that his first statement had been submitted "to the reading and scrutiny of Robert Weil, professor of science at Sarreguemines lycee," who had been interned in the same camps as himself (p. 455). In 1985, at Ernst Zundel's first trial in Toronto, I spoke of M. Klein's recollections but the real specialist on the history of the Auschwitz I swimming pool was at that time none other than the Swedish revisionist Dietlieb Felderer. If I remember correctly, the Canadian press headlined an article on his testimony about it. Moreover, in his writings he often returns to this and other quite concrete, quite precise subjects just as disquieting for the supporters of the exterminationist argument. "there were firemen at the camp with very modern equipment" (p. 9). Amongst the things that he had not expected to find on arriving, in June 1944, "at a camp whose sinister reputation was known to the whole world thanks to the Allied radio broadcasts," one may note, for the detainees, "a hospital with sections specialised in line with the most modern hospital practices" (p. 4), "vast and well fitted-out wash houses along with communal W.C.'s built according to the modern principles of sanitary hygiene" (p. 10), "the micro-wave delousing process which had just been created" (p. 14), "the mechanical bakery" (p. 15) the legal aid for the detainees (pp. 16-17), the existence of "dietetic cooking" for some of the sick, with "special soups and even a special bread" (p. 26), "a library where numerous reference works, classic textbooks, and periodicals could be found" (p 27), the daily rolling by, next to the camp, of "the Krakow-Berlin express" (p. 29), a cinema, a cabaret, an orchestra (p. 31), etc. M. Klein also notes the horrible aspects of life in the camp and all the rumours, including the "horrific stories" of gassings which he seems not really to have believed until after the war, and then only thanks to the testimonies in the "various trials of war criminals" (p. 7). 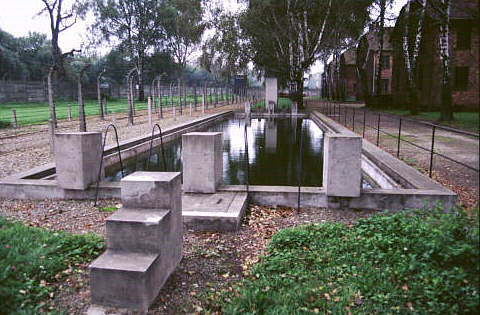 A wartime detainee and, like M. Klein and R. Weil, a Jew himself, confirmed, in a short testimony written in 1997 entitled "Une Piscine Auschwitz," that he saw, in July 1944, dozens of his fellow prisoners busy at work on the said pool which, he pointed out, had "a diving board and an access ladder"; he could have added "along with three starting blocks for races." He wrote that towards the end of that month "a newsreel director had some deportees filmed swimming there." As one might expect, he enlivened his account with the regular stereotypes of the SS men's or kapos' brutality and he saw in the making both of the pool and of the film nothing but a propaganda operation. His report ends with two interesting remarks. First, that in 1997 no guide was "aware" of the pool (which nonetheless stands right before the guides' very eyes and of which a photograph accompanies the article: we read that this picture, showing a swimming pool full of water, was taken in that year) and that the author would like to know just where the newsreel might be today. His question is akin to those put by some revisionists: might the film not be "at the headquarters of the International Red Cross"? Doubtless he meant: at the International Tracing Service (ITS) located at Arolsen-Waldeck in Germany and operating under the direction of the International Committee of the Red Cross (ICRC), with headquarters in Geneva. Since 1978, this body has barred revisionists from its archives, which are known to be an exceptionally rich resource. For its part, the Auschwitz State Museum probably possesses documentation relevant to various aspects of this swimming pool's construction, e.g. the project, the plans, the financing, the requests for and the supply of building materials, the requisition of labourers, the inspection visits. (Reference for this account: R. Esrail, registration no. 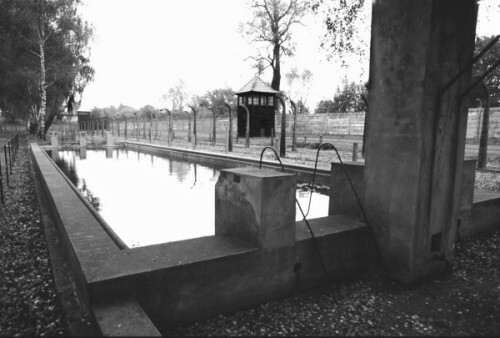 173295, - Une piscine ¦ Auschwitz ª, in AprËs Auschwitz (Bulletin de l'Amicale des dÈportÈs d'Auschwitz), n 264/octobre 1997, p. 10). 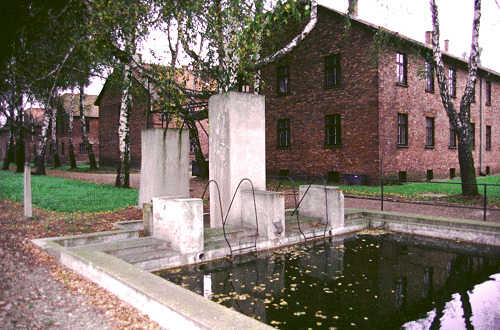 "Swimming Pool, Auschwitz Camp, June 1996. Inmates from Auschwitz and surrounding camps enjoyed swimming and sunbathing beside the pool on Saturday and Sunday afternoons. Although not as popular as sports like soccer, some competition was organized where inmates from different countries of origin, and different camps, raced in individual and relay events." From www.air-photo.com , now off-line.